Silverline Designs: Inspired by JulieHRR...again! I loved the white flower on the red background and the mix of papers and colours...it sent me straight to my Mushroom Trio stamp and red shimmer paper from A muse. I just received a package from A muse in the mail (winnings from playing along during VSN - thank you A muse, I love everything you sent!!) which included gorgeous seafoam sheer ribbon, so I pulled off a piece of that to use. 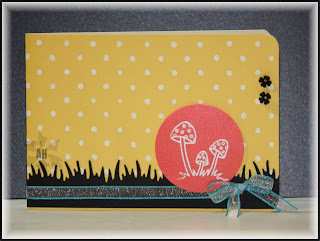 I love cards with a touch of black...grass punched with my Martha Stewart grass punch was the perfect addition...it matches the grass under the mushrooms! I stared at the card for a while, left it overnight and decided today to add in some tiny embellishments in black to complete the card (they are from Stamping Bella). Thanks for visiting...check out the challenge and play along!